Jeff Skinner talks about leaving the Hurricanes and Raleigh. 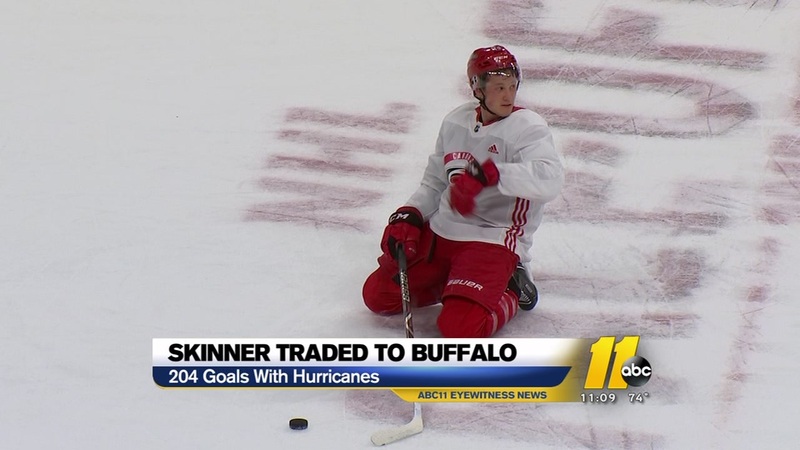 RALEIGH, NC (WTVD) -- You could've forgiven Jeff Skinner if he aired out some sour grapes Friday. A shot at a coach here, a lament about management there. Instead, there was none of that. Skinner was unfailingly gracious and appreciative when talking about his time with the Carolina Hurricanes and his eventual trade. It seems that Skinner's lived a lifetime already in Raleigh. Eight years of his 26 total is a pretty good chunk. It's trite to say he came here a boy and is leaving a man, but that's pretty much what happened. It turns out something can be totally expected and still be stunning in the moment. Jeff Skinner is no longer a Hurricane. During a teleconference Friday, I asked Skinner to summarize what his years here meant to him and how he'd characterize his career with the Canes. Warning: if you're having a hard time handling the news that Skinner is no longer a Hurricane, his answer won't make you feel any better. Watch the video to hear from the former Cane.